Made with lavender from Merrie Buchsbaum's garden, this pretty pen makes inspiration bloom. You'd probably rather be in the garden than writing checks to your utility companies. Merrie Buchsbaum's lavender pen brings a posy and the power company together at your desk. 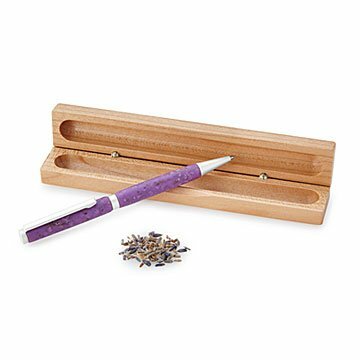 Handmade with resin tinted and textured with fresh-dried lavender petals, seeds, and stems from Merrie's organic garden, each one-of-a-kind pen is housed in a handsome maple wood gift box. Handmade in Connecticut. Merrie Buchsbaum has been a polymer artist for over 25 years. She is a self-taught artist and has a background in ceramics, photography and art history. Merrie is well known for her sense of color and patterns. More recently Merrie began incorporating natural ingredients into the polymer just like other cultures blended organic matter into clay. As a result Merrie is able to achieve unique colors and textures from nature. Merrie’s work has been widely published in major newspapers, magazines and seen on CBS as well as Fox news. In 2014 the Made in America movie was released nation wide. Merrie was chosen as one of four leading businesses to tell the story about Made in America.